Our Adelantado Trilogy: Book One Walkthrough is your perfect companion as you journey to the New World as the Adelantado, the caretaker of the new lands. Harvest food, repair buildings, and seek out new lands in this exciting resource management game. Our Adelantado Walkthrough includes full maps of areas, helpful screenshots, and detailed instructions on how to beat each chapter within the expert time. 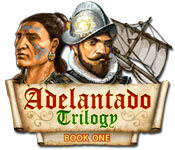 Adelantado Trilogy: Book One, from the makers of Roads of Rome, is a great cross between that game and hmmm, maybe, the Westward Kingdoms series or Totem Tribe. Game Modes: Choose how fast you want the timer to run out to get Expert times. On the Hard Mode, you usually get 10 minutes less to finish the level and have much, much less in the way of supplies lying around. This Walkthrough is written for Normal and Hard modes. Upgrades: You cannot upgrade until Chapter 4. You cannot save this game in the middle of a chapter and they can last up to 45 minutes so be aware. Your character wields the sword, so you can open barrels and pots, break throughbushes, pick up meat, and interact with characters. Build production buildings as close to possible to a warehouse.